Live from Altötting, Bavaria, Germany. Holy Mass on the Solemnity of Patrona Bavariae, and the Opening of the Pilgrimage Season, from the Basilika St. Anna. Presided by Kurt Cardinal Koch, President of the Pontifical Council for Promoting Christian Unity. Live from Verona, Italy. Holy Mass for the Conclusion of the ‘Notte Bianca della Fede’ (White Night of Faith), from the Basilica of San Zeno. Live from Sala Stampa, Vatican City. Press Conference for the Presentation of the conclusion of the Plenary Conference of the Pontifical Academy of Social Sciences, on the theme: “Towards a Participatory Society: New Roads to Social and Cultural Integration. Live from Częstochowa, Poland. Holy Mass on the Feast of Our Lady, Queen of Poland, from Jasna Góra Monastery. Presided by Archbishop Stanisław Gądecki, Metropolitan Archbishop of Poznań. Live from Siegburg, Germany. Ceremony for the Opening of Katholisch-Sozialen Instituts of Michaelsberg. Live from Eichstätt, Germany. Holy Mass with conferral of Orders to the Sacred Priesthood for the Diocese of Eichstätt, from Dom SS. Salvator, Mariä Himmelfahrt und Willibald. Presided by Bishop Gregor Maria Franz Hanke, O.S.B., Bishop of Eichstätt. Those Rev Deacons ordained to the Priesthood are as followed: Kilian Schmidt, Thomas Attensberger, and Robert Willmann. Please Pray for these men. Live from Paul VI Audience Hall, Vatican City. Audience of Pope Francis with participants of the Meeting of National Coordination of Local Governments for peace and human rights. Live from Częstochowa, Poland. Coverage of XVIII Youth Pilgrimage with Radio Maryja on Jasna Góra. Live from Wigratzbad, Bavaria, Germany. Holy Mass in the Extraordinary Form of the Roman Rite, Solemn High Mass on the 3rd Sunday after Easter, with the Seminarians of the Priestly Fraternity of St. Peter of the International Seminary of St. Peter, from the Sühnekirche, Gebetsstätte Wigratzbad. Live from St. Peter’s Basilica, Vatican City. Holy Mass on the 4th Sunday of Easter, Good Shepherd Sunday, with conferral of Orders to the Sacred Priesthood to seminarians of the Pontifical Major Roman Seminary and Diocesan Missionary College of Rome “Redemptoris Mater”. Presided by Pope Francis. Those Rev Deacons ordained to the Priesthood are as followed: Andreas Biancucci, Dario Loi, Mattia Pica, Gabriele Vecchione [Pontifical Major Roman Seminary], Rolando Francesco Rizzuto, Alfonso Torres Elias [Redemptoris Mater], Andrea Bonfanti [Congregation of the Brothers of Our Lady of Mercy], Octavio Angel Jímenez Bello [Religious Congregation of the Family of Disciples], David Behbud Mustafayev [Apostolic Prefecture of Azerbaijan], and Aniello Nappo [Diocese of Nocera Inferiore-Sarno]. Please Pray for these men. Live from Siegburg, Germany. Holy Mass for the Opening of the Kath.-Sozialen-Instituts, Marktplatz. Live from Biłgoraj, Poland. Family of Radio Maryja and Holy Mass from the Parish Church of St. Mary Magdalene. Presided by Bishop Jan Śrutwa, Bishop Emeritus of Zamość-Lubaczów. Live from Metuchen, New Jersey, USA. Holy Mass for the Episcopal Consecration and Installation of James Francis Checchio, as Bishop of Metuchen, from St. Francis of Assisi Cathedral. Principle Consecrator is Archbishop John Joseph Myers, Metropolitan Archbishop of Newark, New Jersey, Superior of Turks and Caicos. Co-consecrators are Bishop Paul Gregory Bootkoski, Bishop Emeritus of Metuchen; and Bishop Dennis Joseph Sullivan, Bishop of Camden, New Jersey. Live from Wigratzbad, Bavaria, Germany. Holy Mass in the Extraordinary Form of the Roman Rite, Missa Cantata on the Solemnity of Solemnity of the Ascension of the Lord, from the Sühnekirche, Gebetsstätte Wigratzbad. Live from San Giovanni Rotondo, Foggia, Italy. Holy Mass on the 60th Anniversary of the Founding by Padre Pio of the Hospital ” in San Giovanni Rotondo. Presided by Francesco Cardinal Montenegro, Archbishop of Agrigento. Live from Kalisz, Poland. Holy Mass on the Solemnity of the Ascension of the Lord, for the Intentions of the family and defence of Pro-Life and the Unborn, from the Basilica of St. Joseph. Live from the Apostolic Palace, Vatican City. The awarding of the Internationaler Karlspreis der Stadt Aachen, the Charlemagne Prize 2016 to Pope Francis, in recognition of activities favoring peace and European integration, from the Sala Regia. Live from Paul VI Audience Hall, Vatican City. Audience of Pope Francis with the Italian NGO Medici con l’Africa Cuamm (Doctors with Africa Cuamm). Live from Verona, Italy. Holy Mass for Ordinations to the Sacred Priesthood, for the Diocese of Verona,from the Cathedral of S. Maria Assunta. Presided by Bishop Giuseppe Zenti, Bishop of Verona. Live from Eichstätt, Bavaria, Germany. Holy Mass for the state-wide Bavaria Pilgriamage for the Patrona Bavariae, from the Eichstätter Residenzplatz. Live from Wigratzbad, Bavaria, Germany. Holy Mass, in the Extraordinary Form of the Roman Rite, Solemn High Mass on Dominica Post Ascensionem, with the Seminarians of the Priestly Fraternity of St. Peter (FSSP), from the Sühnekirche, Gebetsstätte Wigratzbad. Live from Pompeii, Italy. Holy Mass, followed by the recitation of the Suplication of the Blessed Virgin of the Rosary of Pompeii, from the Pontifical Shrine of the Blessed Virgin of the Rosary of Pompei. Presided by Archbishop Tommaso Caputo, Prelate of Pompei o Beatissima Vergine Maria del Santissimo Rosario. Live from San Giovanni Rotondo, Foggia, Italy. Holy Mass on the Solemnity of the Ascension of the Lord, from the Monastery Church of Santa Maria delle Grazie. Live from Kevelaer, Germany. Holy Mass for the Pilgrimage to the Basilica of St. Mary, Comforter of Sinners. Presided by Bishop Norbert Trelle, Bishop of Hildesheim. Live from Zakopane, Poland. Family of Radio Maryja Meeting and Holy Mass for the start of the month of Mary, from the Shrine of Our Lady of Fatima. Live from Sala Stampa, Vatican City. Press Conference of presentation of the Extraordinary Holy Year for the Jubilee of Mercy, scheduled from December 8, 2015 to November 20, 2016. Live from Lexington, Kentucky, USA. Holy Mass for the Episcopal Ordination and Installation of John Eric Stowe, O.F.M. Conv., as Bishop of Bishop of Lexington, from the Cathedral of Christ the King. Principal Consecrator is Archbishop Joseph Edward Kurtz, Archbishop of Louisville, Kentucky. Co-consecrators are Bishop Armando Xavier Ochoa, Bishop of Fresno, California; and Bishop Gabriel Enrique Montero Umaña, O.F.M. Conv., Bishop of San Isidro de El General, Costa Rica. Live from Verona, Italy. Holy Mass on the Feast of St. Dominic Savio, and the 38th Anniversary of Radiopace, from the Sanctuary of Maria Stella dell’Evangelizzazione. Live from Kevelaer, Germany. Holy Mass for the Pilgrimage to the Basilica of St. Mary, Comforter of Sinners. Presided by Bishop Franz Vorrath, Titular Bishop of Vicus Aterii, Auxiliary Bishop Emeritus of Essen. Live from Kalisz, Poland. Holy Mass for the Intentions of the family and defence of Pro-Life and the Unborn, from the Basilica of St. Joseph. Presided by Bishop Kazimierz Ryczan, Bishop Emeritus of Kielce. Live from Verona, Italy. Holy Mass for the Welcoming of the Pilgrimage Image of Maria Stella dell’Evangelizzazione, from the Parish Church of San Vito di Legnago. Presided by Bishop Giuseppe Zenti, Bishop of Verona. Live from Verona, Italy. Holy Mass with the Pilgrimage Image of Maria Stella dell’Evangelizzazione, from the Parish Church of San Vito di Legnago. Live from Pompeii, Italy. Holy Mass, followed by the reciatation of the Suplication of the Blessed Virgin of the Rosary of Pompeii, from the Pontifical Shrine of the Blessed Virgin of the Rosary of Pompei. Presided by Archbishop Tommaso Caputo, Prelate of Pompei o Beatissima Vergine Maria del Santissimo Rosario. Live from Verona, Italy. Reciatation of the Rosary with the Pilgrimage Image of Maria Stella dell’Evangelizzazione, from the Parish Church of San Vito di Legnago. Live from Verona, Italy. Celebration of Thanksgiving for the completion of the restoration of the ceiling of the Cathedral of S. Maria Assunta. Presided by Attilio Cardinal Nicora, President Emeritus of the Administration of the Patrimony of the Apostolic See. Live from Mamilla, Jerusalem, Israel. Holy Mass for the Opening of the upcoming Canonisation celebrations of Marie Alphonsine and Maryam Bawardi, from the Sanctuary of Mother Marie Alfonsine. Live from Verona, Italy. Holy Mass for the Conclusion of the Pilgrimage Image of Maria Stella dell’Evangelizzazione, from the Parish Church of San Vito di Legnago. Live from Mamilla, Jerusalem, Israel. Prayer of the Rosary and Divine Liturgy, in the Syrian Catholic Rite, for the upcoming Canonisation celebrations of Marie Alphonsine and Maryam Bawardi, from Mother Alphonsine Shrine. Live from Aparecida, São Paulo, Brazil. Holy Mass on the sixth day of the 52nd General Assembly of the Conferência Nacional dos Bispos do Brasil (CNBB) [National Conference of Bishops of Brazil], from the Basilica and National Shrine of Nossa Senhora da Aparecida. Presided by Bishop Francesco Biasin, Bishop of Barra do Piraí-Volta Redonda, Rio de Janeiro. Live from Krzeszów, Poland. Family of Radio Maryja and Holy Mass from the Shrine of Our Lady of Grace. Bishop Marek Mendyk, Titular Bishop of Rusuccuru, Auxiliary Bishop of Legnica. Live from Paris, France. Prayer Vigil for Life, with the Bishops of the 8 Dioceses of Île-de-France, from the Cathedral of Notre-Dame de Paris. Led by André Cardinal Vingt-Trois, Archbishop of Paris. Live from Verona, Italy. Holy Mass on the Feast of St. Dominic Savio, from the Sanctuary of Maria, Stella dell’Evangelizzazione. Live from the San Damaso Courtyard, Vatican City. Oath Ceremony of the Pontifical Swiss Guard. On the commemoration of the Sack of Rome in which in the year 1527 members of the Pontifical Swiss Guard gave their lives for the defense of the Church and the Pope. Live from Aparecida, São Paulo, Brazil. Holy Mass on the eighth day of the 52nd General Assembly of the Conferência Nacional dos Bispos do Brasil (CNBB) [National Conference of Bishops of Brazil], from the Basilica and National Shrine of Nossa Senhora da Aparecida. Presided by Archbishop Luis Gonzaga Silva Pepeu, Archbishop of Vitória da Conquista, Baia. Live from Pompeii, Italy. Holy Mass on the Feast of Our Lady of Pompeii, from the Pontifical Shrine of the Blessed Virgin of the Rosary of Pompeii. Presided by Pietro Cardinal Parolin, Secretary of the Secretariat of Vatican City State. At the conclusion of Mass; Recitation of the ‘Supplica alla Madonna di Pompei’ (Supplication to Our Lady of Pompeii). Live from Aparecida, São Paulo, Brazil. Holy Mass on the ninth day of the 52nd General Assembly of the Conferência Nacional dos Bispos do Brasil (CNBB) [National Conference of Bishops of Brazil], from the Basilica and National Shrine of Nossa Senhora da Aparecida. Presided by Archbishop Jacinto Bergmann, Archbishop of Pelotas, Rio Grande do Sul. Live from Ottawa, Cananda. Coverage of the Canadian 17th National March for Life, from Parliament Hill. Live from Milan, Italy. ‘Venite a Vedere Questo Spettacolo’ Event (Come and See the Show), a modern retelling of the Passion according to Luke, with music, theatre, dance, prayer and testimonies. 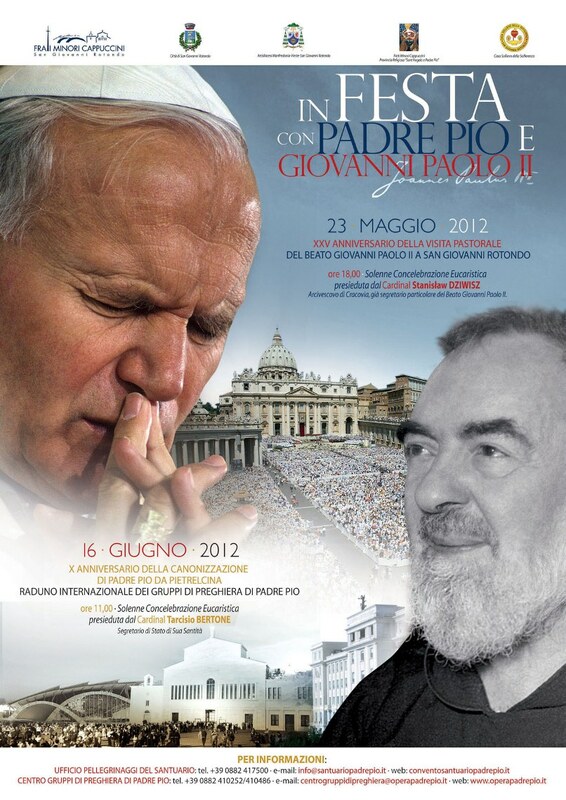 With the participation of Angelo Cardinal Scola, Archbishop of Milan. Live from Aparecida, São Paulo, Brazil. Holy Mass for the Closing of the 52nd General Assembly of the Conferência Nacional dos Bispos do Brasil (CNBB) [National Conference of Bishops of Brazil], from the Basilica and National Shrine of Nossa Senhora da Aparecida. Presided by Archbishop José Belisário da Silva, O.F.M., Archbishop of São Luís do Maranhão, Maranho. Live from St. Peter’s Basilica, Vatican City. Meeting of Pope Francis with the world of Education at the ‘La Chiesa per la Scuola’ Event [The Church for Schools]. Live from Aachen, Germany. Holy Mass for the Investiture of new Knights to the Equestrian Order of the Holy Sepulchre of Jerusalem, from the Kaiserdom Unserer Lieben Frau. Presided by Reinhard Cardinal Marx, Archbishop of München und Freising. Tape-Delayed from Cologne, Germany. Holy Mass of Thanksgiving for the Canonisation of Sts. John XXIII and John Paul II, from the Kölner Dom, the Cathedral of Sts. Mary and Peter. Presided by Joachim Cardinal Meisner, Archbishop Emeritus of Cologne. Live from Warsaw, Poland. Holy Mass for the victims of the Smolensk Air disaster, 49 months after the incident, from St. John’s Archcathedral. Live from Shahtoul, Lebanon. Divine Liturgy, in the Maronite Rite, for the Funeral of Adibeh Kallassi, late mother of the Director General of Tele Lumiere, from St. Joseph Church. Presided by Bishop Antoine Nabil Andari, Titular Bishop of Tarsus dei Maroniti, Auxiliary Bishop of Jebbeh–Sarba–Jounieh. Live from St. Peter’s Basilica, Vatican City. Papal Mass on the 4th Sunday of Easter, for Priestly Ordinations for the Diocese of Rome. Presided by Pope Francis. Live from Bialystok, Poland. Radio Maryja Family Gathering and Holy Mass on the 1st Anniversary of the Beatification of Blessed Pope John Paul II, from the Shrine of the Divine Mercy in Bialystok. Presided by Archbishop Edward Ozorowski, Archbishop of Bialystok, with homily delivered by Archbishop Mieczyslaw Mokrzycki, Archbishop of Lviv. Live from Loreto, Ancona, Italy. Forum of the Salesian Youth Movement (Movimento Giovanile Salesiano), from the Piazza of the Basilica della Santa Casa. Live from Loreto, Ancona, Italy. Holy Mass at the Forum of the Salesian Youth Movement (Movimento Giovanile Salesiano), from the Piazza of the Basilica della Santa Casa. Presided by Don Pascual Chavez, Rector Major of the Salesians. Live from Krakow, Poland. Holy Mass on the 1st Anniversary of the Beatification of Blessed Pope John Paul II, from the Cathedral Basilica of Sts. Stanislaus and Wenceslaus. Presided by Stanisław Cardinal Dziwisz, Archbishop of Krakow. Live from Częstochowa, Poland. Holy Mass on the Solemnity of Mary, Queen of Poland, from the Jasna Góra Monastery. Before Mass the dedication of an epitaph dedicated to the Victims of the Smolensk Air Disaster, in front of the Chapel of the Miraculous Image of the Black Madonna of Częstochowa. Presided by Archbishop Józef Michalik, Archbishop of Przemyśl. Live from Kalisz, Poland. Mass for the intentions of the family and defence of Pro-Life and the Unborn, from the Basilica of St. Joseph. Presided by Bishop Krzysztof Nitkiewicz, Bishop of Sandomierz. Live from Haifa, Israel. Holy Mass in the Greek Melkite Rite, on the occasion of the Diaconate Ordination of Antonios Moussa Salman, by Archbishop Elias Chacour, Archbishop of Akka (Melkite), from the Sermon on the Mount Church, St. Elias Educational Institute. Live from the San Damaso Courtyard, Vatican City. Oath Ceremony of the Pontifical Swiss Guard. Live from Dublin, Ireland. Prelude Mass on the eve of the 50th International Eucharistic Congress, with the volunteers and staff of the International Eucharistic Congress, from the RTE Studios. Presided by Archbishop Charles John Brown, Titular Archbishop of Aquileia, Apostolic Nuncio to Ireland. Re-broadcast from Pittsburgh, Pennsylvania, USA. Holy Mass in the Byzantine Rite of the Ruthenian Catholic Church, on the occasion of the installation of William Charles Skurla, as the Metropolitan Archbishop of Pittsburgh of the Ruthenians, from St. John the Baptist Byzantine Catholic Cathedral. Live from Aparecida, Brazil. Holy Mass from the Basilica and National Shrine of Our Lady of Aparecida.